Deputy Chief Gerald (Jay) A. Fordham. . .
has served the citizens of Clayton County since 1990. 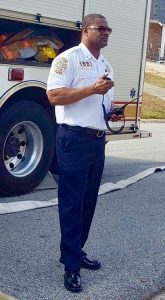 He currently oversees the Operations Division of Clayton County Fire & Emergency Services. He directs, supervises and evaluates the operations and personnel of this division. Chief Fordham coordinates the functions associated with fire, rescue, disaster emergency, protecting life and property, emergency medical assistance and administrative activities. Chief Fordham currently commands over 350 sworn personnel that responded to over 40,000 incidents, and counting, annually. These incidents included Fire, EMS, Hazardous Materials and Technical Rescue (GSAR) operations. This experience gives him an intricate understanding of the challenges the men and women in his division are confronted with on each incident. Chief Fordham began his career on July 19, 1990. He started as a firefighter. Through the years, he was assigned to every position within operations, working his way up the ranks to Deputy Chief Of Operations. Chief Fordham is a 5 time world champion for the Clayton County over 40 combat challenge team. They participated in the Scott Firefighter Combat Challenge Competition where they competed against fire departments from all around the world They dominated the competition 5 out of 7 years.